Strengthen your bones by making sure your body gets enough of the amino acids lysine, carnitine, and arginine. 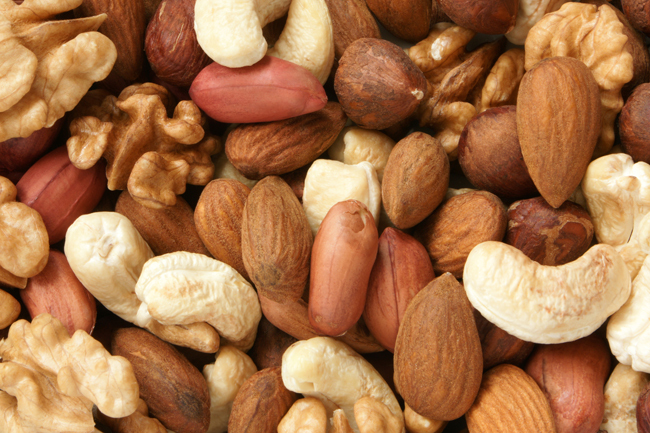 Nuts are a worthy source of the amino acid lysine, as are beans and vegetables. Osteoporosis can indeed be incapacitating if your ignore it. But, you can take control of your own health and stop or even reverse bone loss. This typically involves a combination of natural healing strategies—not just a single pill or action. Meaning, you can’t take loads of calcium and expect your bones to magically repair themselves. While calcium and other vitamins and minerals are important for bone health, your body may require additional nutritional support… and you just may be able to get that extra bone-building boost you need from three important amino acids. To understand the role of amino acids as a natural treatment for osteoporosis, you first need to understand why your body needs calcium. Calcium is stored in the teeth and bones, with a small amount in the blood stream to aid in regulating heartbeat, releasing hormones, sending and receiving nerve impulses, squeezing and relaxing muscles, and clotting blood. Calcium is continuously lost from the body through sweat and waste. 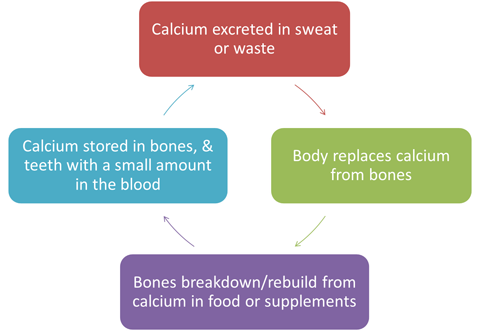 When calcium is lost, it is replaced with the stores found in the bones. In addition, as a process of normal tissue growth, the body constantly breaks down bone material and rebuilds it, using calcium from foods or supplements for replacement. Taking calcium by itself—without other supportive nutrients—will do little good because it will not be adequately absorbed by the body. That’s where the amino acid, lysine, comes in to play. Lysine preserves bone density because it aids in the body’s absorption of calcium. It also decreases the total amount of calcium that is lost in urine. When you take lysine with a calcium supplement, your body is able to absorb more of the calcium than it normally would. In addition, lysine works in conjunction with vitamin D to help build and maintain strong bones. Besides its synergistic effects with calcium and vitamin D, lysine acts to block enzymes which break down collagen. Collagen is the basic component of various connective tissues (such as cartilage) and bone. In fact, collagen makes up about 25 percent of the total amount of proteins in the body. Some people refer to collagen as “the glue that holds the body together.” Without it, the body would, quite literally, fall apart. Therefore, keeping collagen healthy is a key when you’re using any natural treatment for osteoporosis, and this can be achieved by consuming adequate amounts of lysine. Lysine cannot be synthesized in the body so it must be ingested either through foods or supplements. Foods rich in protein are good sources of lysine: nuts, beans, meat (specifically red meat, pork, and poultry), cheese (particularly parmesan), certain fish (such as cod and sardines), eggs, spirulina, and fenugreek seed. Lysine supplements are available in tablets, capsules, and liquids, and are usually sold in the “L-lysine” form. The typical dosage is 1,000 mg daily. You should not take lysine if you have a history of gallstones or if you are taking aminoglycoside antibiotics (gentamicin, neomycin, streptomycin, etc.) as it may increase the risk of kidney toxicity. Arginine is considered a semi-essential amino acid; although the body normally makes enough of it, supplementation with additional amounts is sometimes needed. Arginine is a crucial factor for bone creation because, just like lysine, it supports the production of collagen. In this way, arginine supports the growth of the osteoblasts (bone-forming cells). Arginine is so critical for bone health, especially in women over 45, that one study actually showed that an arginine deficiency caused osteoporosis. Other research has revealed that arginine makes bone-building cells more active while at the same time works against bone-destroying cells. Experts therefore recommend that the administration of arginine should be included in any osteoporosis treatment plan. Studies have shown that taking lysine in combination with arginine both makes bone-building cells more active and increases the production of collagen. Consequently, you should take arginine and lysine together on an empty stomach in a 1:1 ratio. You should not take both supplements together in their “L” form because they compete with the same receptors in the body. Therefore, it is recommended you take one – either arginine or lysine – in their “L” form and the other should be in the non-L form. For example, take 1,000 mg of arginine with 1,000 mg of L-lysine daily. Carnitine is derived from an amino acid and is closely related to the B vitamins. It is most well-known for its ability to regulate fat metabolism as well as increase energy levels for exercise endurance. Because it is concentrated in the cardiac muscles, carnitine has been shown to reverse heart damage after a heart attack. But, what is not so-well known about carnitine is it is also deposited in skeletal tissues and it can slow bone loss by decreasing the rate of bone turnover, especially in postmenopausal women. Carnitine is found in beef, bacon and other pork products, cheese, avocados and asparagus. It is available in supplement form and is usually labeled, L-carnitine, acetyl-L-carnitine, or propionyl-L-carnitine. The typical dose ranges between 1,000 and 3,000 mg per day. All of the aforementioned amino acids can be found in protein sources (meats, dairy, and nuts). But, when it comes to bone health, there is one caution to eating large amounts of protein. Researchers have confirmed that the nations of the world with the highest animal protein consumption also have the highest rate of hip fractures. And, this is in spite of the fact that these high protein eaters have some of the highest levels of calcium intake in their foods. Some have used this research conclusion to promote the idea of reduced protein consumption as a means for reducing osteoporosis risk. But, this is not the case. The key seems to be what kind of protein is being consumed and whether it produces an acid-effect or an alkaline-effect in the body. As the blood becomes more acidic, it takes calcium from the bones to neutralize the acidity. Non-organic meat, dairy, and grain protein are strong acid-producing proteins whereas plant protein such as beans and nuts are alkaline-producing. So the key is to get plenty of protein of the right kind. To produce a bone-building effect, a person should consume a daily protein intake of 1.0 gram per kg of body weight with a large part of that protein coming from vegetable sources. For a 150-pound person, that translates into 67.5 grams of protein per day (0.45 grams of protein per pound). The bottom line is not to cut back on protein consumption, but to get less of it from non-organic meat, dairy, and grain and get more of it from beans, nuts, or vegetables. Annals of Surgery. 2001 Sept; 23(3): 369–375. Journal of Bone and Mineral Research, 2002; 17(7): 1264-1272. Phytomedicine 2008 Aug; 15(8) :595-601. Biomedicine & Pharmacotherapy. 2001 May; 55(4): 213–220. American Journal of Clinical Nutrition, 2003;77(6):1517-1525.
a heart attack, amino acids, antibiotics, b vitamins, bone, bone building, bone density, bone health, bone loss, calcium, can osteoporosis be reversed, can osteoporosis be reversed without drugs, carnitine, cartilage, collagen, dairy, endurance, exercise, fenugreek, for osteoporosis, gallstones, good health, health, heart attack, increase energy, increase energy levels, metabolism, natural healing, natural treatment, natural treatment for, natural treatment for osteoporosis, nutrients, nutrition, nuts, organic, osteoporosis, osteoporosis risk, osteoporosis symptoms, osteoporosis treatment, postmenopausal, postmenopausal women, prevent osteoporosis, protein, protein sources, strong bones, supplement, supplements, treatment for osteoporosis, vegetables, vitamin, vitamin d, vitamins, vitamins and minerals, what causes osteoporosis, without drugs, your bones. Great blog post! It’s useful information. I would like to see the substantiation for the osteoporosis and other claims. I have looked everywhere for either lysine or arginine in the non-L form to follow these directions … [Therefore, it is recommended you take one – either arginine or lysine – in their “L” form and the other should be in the non-L form. ] Can you point me in a direction on where I can find one or the other. Online is definitely ok. Thank You! I have looked for either arginine or lysine – in their none “L” form and can not find anywhere. Can someone point me in the right direction?